“Keep Their Stories Alive” by Harry Thetford is available now! Receive your copy today with only a $20 suggested donation to American Heroes for North Carolina. 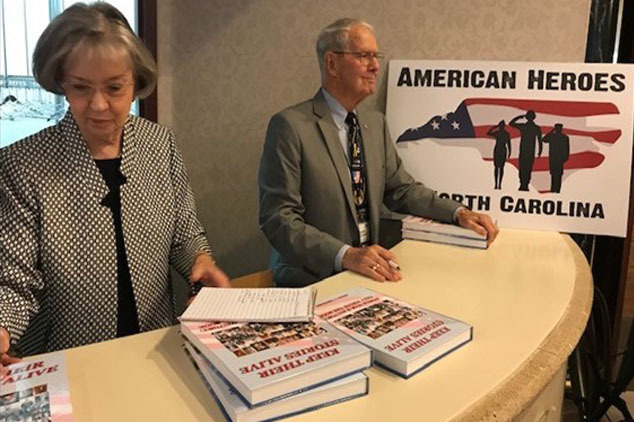 In conversational tones, but with boresight accuracy, “Keep Their Stories Alive” chronicles the World War II experiences of 135 men and women with connections to the Piedmont Triad region of North Carolina. Among other venues, this 432-page journey is a primer on Doolittle’s Raid, Guadalcanal, D-Day, the Battle of the Bulge, aircraft from trainers to B-29s, ships from Higgins Boats to battleships, POW camps, Iwo Jima, Okinawa and the atomic bomb – and much more. Flavored by local men and women who insist they didn’t do anything heroic, these “nuts and bolts” installments are the real deal. Now in it’s second limited printing, this book is a must-read for anyone interested in World War II and/or local Piedmont Triad NC history. Author Harry T. Thetford has provided a magnificent record of World War II experiences with his compilation of interviews as recorded in “Keep Their Stories Alive”. What a clever way to preserve the experiences of those who made such diverse sacrifices and came home to share their stories for the education of future generations. For a small suggested donation of only $20 to American Heroes of NC non-profit organization, you will receive your very own copy of this compelling and historical significant publication. Please click the Donate button below to get started. The Patriot Award is presented to an individual who served in the military with honor and distinction, led a successful business and who has made a significant contribution to our community. The year, the Patriot Award was presented to Bill Moss. Bill is a US Marine Corps veteran and the founding commandant for the area Marine Corp League Detachment 260. He established the War Memorial Foundation and worked tirelessly for 8 years to complete his vision for the most beautiful private memorial on the East Coast, the Carolina Field of Honor. The Liberty Award is presented to company with a history of at least twenty years in business. The company must show a proven success record, display veteran hiring practices and be owned or led by a veteran who served in the military with honor. The year, the Liberty Award was presented to Haeco Americas. Haeco Americas provides aircraft maintenance, repair services and aerospace manufactured products to a broad array of commercial, government and private customers. They have been doing business in the Triad since 1990, formerly as Timco. Although headquartered in the Triad, Haeco Americas operates in locations throughout the US. Nearly half of their workforce is compromised of form service members and they have several veteran-friendly policies. Present to accept the award on behalf of Haeco Americas was CEO, Richard Kendall. Richard too is a military veteran and served in the British Royal Navy as a Naval Warfare Officer. The Freedom Award is presented to an entrepreneurial company, led by a veteran who served in the military with honor. The company will have existed for at least four years and operated successfully in the Triad. The year, the Freedom Award was presented to Don Brady and Brady Services, a commercial HVAC and building solutions company headquartered in Greensboro, NC. Founded in 1962 by Chairman Don Brady, the company remains a family owned enterprise, today employing over 450 associates with locations in Raleigh, Durham, Fayetteville, and Wilmington. Don Brady grew up in New York and served 8 years in the US Army as an engineer officer. He received his engineering degree from the University of Rochester and in 1962 he started his first company, Brady Trane Services. 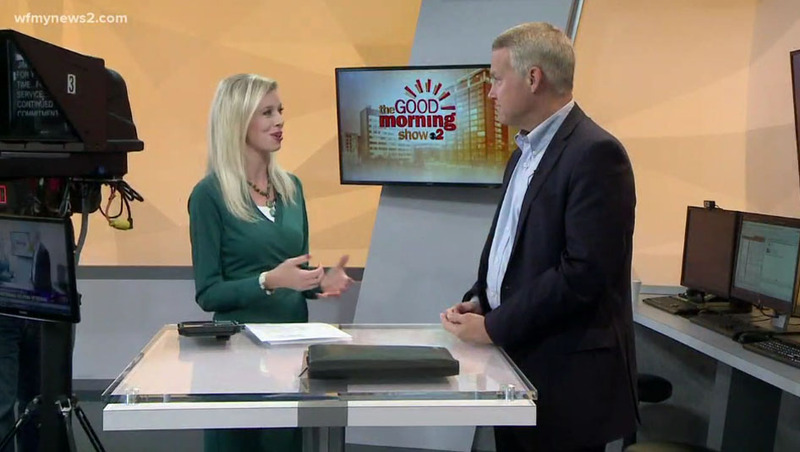 His company has a history of hiring veterans and it maintains many veteran-friendly policies. Don is recognized as one of the leading philanthropists in the area, giving time to Boy Scouts of America, JDRF and many other important causes. We would like to thank everyone who nominated a deserving Veteran. A special thanks also to everyone who attended the event as well as our Sponsors! The 2nd Annual American Heroes For North Carolina Veteran’s Recognition Banquet will be held November 8, 2018 starting at 11:30am at the Koury Convention Center in Greensboro, NC. During this event, the American Heroes for North Carolina, their sponsors and local communities members will have the privilege of honoring Veterans who have returned to North Carolina and who have contributed greatly to the Triad community. Help support us as we present three awards to deserving veterans that have been nominated and selected as best exemplifying the courage and commitment of our American Service men and women. The Patriot Award will presented to an individual who served in the military with honor and distinction and who has made significant contributions in our community. This award is a lifetime achievement award to an individual who has influenced or led a successful business and who has greatly impacted our community, state, or nation. The Liberty Award will be presented to a veteran-friendly company that has greatly impacted our community and with a history of at least 20 years in business. The company must show a proven success record, display veteran-friendly hiring practices, and must have a veteran who served with honor as a key leader of the organization. Presented to an entrepreneurial company, led by a veteran who served in the military with honor. The company will have existed for at least four (4) years and operated successfully in the Triad. We would like to thank everyone who has nominated a deserving Veteran and we look forward to seeing you at the banquet! The Veterans Recognition Banquet was held on Wednesday, November 8th at the Koury Convention Center in Greensboro, NC. During this event, the American Heroes for North Carolina, their sponsors and local communities members had the privilege of recognizing three deserving Veterans who have contributed greatly to the Piedmont Triad area. The Patriot Award was presented to LTG Walter Ulmer (USA, Ret.). LTG Ulmer served as a senior advisor to the South Vietnamese during the Battle of An Loc, one of the pivotal battles in the Vietnam War. 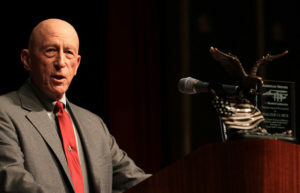 His unit received a Presidential Unit Citation and they were cited for having saved South Vietnam for another three years. Later, LTG Ulmer served at the Army War College and revamped the entire system of officer evaluation and leadership for the Army. After retiring from a long and successful Army career, LTG Ulmer settled in Greensboro and led the Center for Creative Leadership for 10 years, making the transition from a national to an international organization. The Liberty Award was presented to HICAPS, Inc. They are a multi-faceted Services and Construction Management firm founded by Don Hood. They specialize in construction management and telecommunications solutions for public safety and building diagnostics. Dan Hood earned a B.S. from The Citadel and was commissioned in the U.S. Army Corps of Engineers. Dan graduated from the U.S. Army Aviation School (both Rotary & Fixed Wing) and flew helicopters on active duty for five years. He earned an M.S. from Clemson University and has lead HICAPS from an initial startup company 34 years ago. 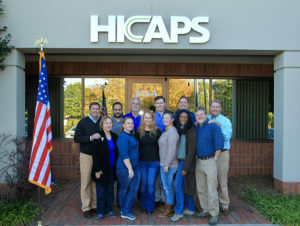 Learn more about HICAPS, Inc. The Freedom Award was presented to Zenergy Technologies, a software and delivery solutions firm started by Chris Laney in 2012. Zenergy is a company of recognized industry experts in Agile, DevOps, software QA and test automation with the intent of becoming the premier software delivery solutions firm in the United States. We would like to thank everyone who nominated a deserving Veteran. 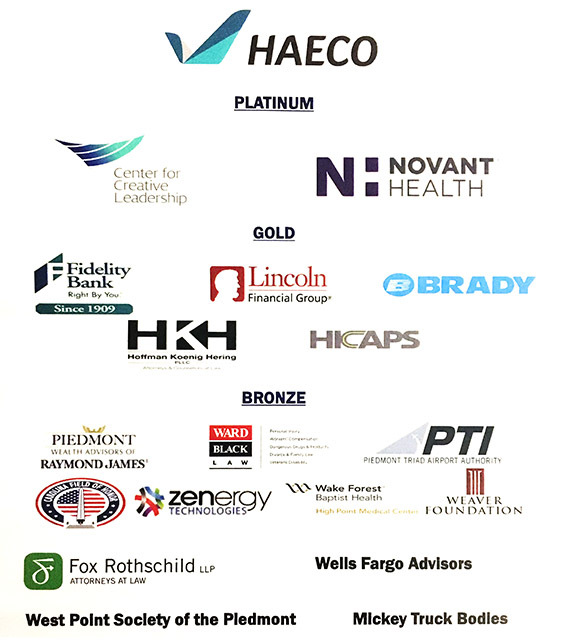 A special thanks also to everyone who attended the event as well as our Sponsors!